The Tanaka TCG27EBSP 26.9cc, 2-Cycle Gas String Trimmer is the best commercial string trimmer for the value it provides. You’re a smart gardener and know the best tools you can use for improving your garden. You want to buy a string trimmer that will help you get rid of the grass and weeds in an efficient manner. But your garden is large and an electric string trimmer would not be the best choice. You need to pick a commercial string trimmer but which one is good? Let us help you with all the details you need to pick the best commercial string trimmer suited for your trimming needs. What is a commercial string trimmer? What are the different types of gas-powered string trimmers? Do you need a commercial string trimmer? How to choose a good commercial string trimmer? A string trimmer is a tool that can help you trim tall grass and weeds in your garden. The string trimmer has a nylon string instead of a blade to do the cutting. This nylon string rotates very fast and helps to cut the weeds. There are different types of string trimmers available that run on electricity or gas. But there are certain qualities in a commercial string trimmer. Such a trimmer can run for hours every day without breaking down or needing a break. The build quality of a commercial trimmer is excellent. It can trim thick and tough weeds that a regular string trimmer would struggle with. It remains comfortable to use for a long period of time. And it can survive a lot of bumps and knocks in the garden without getting damaged. The string trimmers that meet such criteria tend to be the gas-powered ones with a cutting path of 17 inches. The gas-powered string trimmers are based on their engine type. This could be a 2-cycle or 4-cycle engine. The 2-cycle engine has more power compared to the 4-cycle one. But it also needs a mix of oil and gas to work. You need to be careful with the oil/gas mix because it’s different based on the manufacturer. And if the oil is more, it’ll produce more emission. If the oil is less, you risk burning the engine out. You can get a pre-mixed oil/gas mixture for your particular string trimmer though it’ll cost you a bit more. The 2-cycle engine creates more noise and has higher emissions as well. The 4-cycle engine has less power than a 2-cycle one. But it doesn’t need an oil/gas mixture as the oil and gas tanks are separate. It’s also less noisy and has lower emissions than a 2-cycle engine. A string trimmer can help you get rid of weeds with minimal effort. Sure, you can do the same with the good old grass shears but only if you have a small garden. If you have a large garden, it’s good to invest in a commercial string trimmer that can work for hours, is durable, and comfortable to use. This string trimmer can help you trim in places where a lawn mower cannot reach. It’ll help you trim around the garden bed without damaging the fences, trees, and plants. If you need a good power and don’t mind the noise, a string trimmer with a 2-cycle engine should be useful. If you’re OK with a little bit lower power while enduring less noise and pollution, a string trimmer with a 4-cycle engine is good for you. There are certain features you need to know that’ll make it easy for you to choose the commercial string trimmer for your needs. The engine is the most important part of your commercial string trimmer. We have seen that you can get a 2-cycle or 4-cycle engine. We know the differences between the two types of engines. If you want to go for the best power possible and don’t mind the noise and pollution, a 2-cycle engine is good for you. If you care about the environment and your neighbor’s ears, it’s good to go for a 4-cycle engine. You can get the string trimmer with a straight shaft or a curved shaft. You should choose one based on your comfort. The straight shaft is more suitable if you’re tall so you don’t need to bend when using the string trimmer. The curved shaft is more suitable for a short person so they don’t need to hold the trimmer at an awkward angle. The gas-powered string trimmer has an engine whose power is measured in cc. These string trimmers usually come with an engine that has around 20-25 cc power. The higher the power, the more noise it will create. And the price of the string trimmer will rise as well. The cutting head holds the nylon line that does the actual cutting. You don’t want there to be a large gap between the cutting head and the shaft. The tall grass and weeds tend to get stuck in such gaps and it’s not easy to clear them out. The cutting head could come with a bump feed where you bump it on the ground to release more string. Or the string trimmer may have an automatic line feed so it brings out more line as required. The string or monofilament line rotates at a high speed inside the cutting head and does the actual cutting. The higher the quality of this line, the better it will cut and the longer it will last. The string could be places in the cutting head as part of a fixed line or spool. A fixed line means you don’t need to worry about the string getting jammed. But it tends to wear the line out faster. A string as part of the spool will last longer but it could get jammed while your trimming the weeds. The cutting path of the string trimmer determines the reach of the line while cutting. The longer this cutting path is, the larger cutting area your string trimmer will cover. The handle is an important part of your commercial string trimmer because you’ll be using it for a while in the garden. The strong engine in such a trimmer generates high power that causes a lot of vibrations in the handle. So you want to make sure it’s comfortable to use for long periods of trimming. The handle design comes in two types – bike handle or loop handle. A bike handle has two separate grips like a bike. It’s mostly designed for right-handed use. A loop handle is a wide loop on the shaft. This makes it usable with both hands with different grip positions. It’s nice if you can have a handle that can be adjusted for length and various angles. And ensure that the handle has an ergonomic grip that is soft and comfortable. The weight of a commercial string trimmer will be more than regular ones. That’s because of the powerful engine and gas tank they carry. But that does not mean they’re uncomfortable to use. They tend to have a good balance when the cutting head and the engine are on the opposite ends of the shaft. 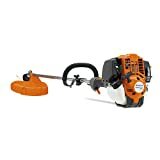 Try to get a commercial string trimmer that has the best weight that you can manage in your garden for a long period of trimming. One of the best qualities of a commercial string trimmer is the durability. They tend to last a long time even with a lot of trimming activity. They don’t get damaged even when faced with bumps and knocks while being used in the garden. So pick a string trimmer that has excellent durability and it’ll last you for several years. The string used in a trimmer can be of cheap or good quality. The good thing is that they come cheap and are easy to replace. Try to pick a brand that makes such strings with the best quality and stick to using them. A commercial string trimmer tends to be expensive compared to average ones because of the quality, power, and durability they hold. They tend to be gas-powered which usually are higher in price than the electric ones. The price of a commercial string trimmer varies based on how powerful the engine is, what kind of engine it is, and the manufacturer. A commercial string trimmer will come with a warranty than ranges from two to four years. This should be sufficient to cover you in case something odd should happen with the string trimmer. It’s not a great feeling to get injured by the string trimmer. That’s why you should wear protective equipment before using the trimmer. Wear a good pair of jeans and shoes that cover your feet. You want to wear safety goggles to protect your eyes from flying debris. Gas trimmers can be loud so protect your ears with ear muffs or ear plugs. Protect your hands by using a good pair of safety gloves. Keep your body away from the muffler because that tends to get quite hot. Try not to hit the trimmer to a fence or a tree as it can damage it. Make sure to read the manual before using the string trimmer to know how to use them. Before starting the gas trimmer, you’ll need to pump the primer bulb as mentioned in the manual. This allows the gas from the tank to reach the carburettor so it can start fast. Set the gas trimmer to full choke. Place the trimmer on the ground, squeeze the throttle and pull the rope a couple of times. Then set the choke to the middle position, squeeze the throttle and pull the rope so that the gas trimmer starts. If it does not start, you can wait a few seconds and try to start it again with the same process. Pick the trimmer up with the right hand on the throttle and the left hand on the assist handle. Hold the throttle for about a minute to warm up the engine. It’s best to use the trimmer in a sideways motion keeping it parallel to the ground. You want to use the tip of the trimmer to do the cutting or you’ll overload the engine. Use the trimmer in a direction that the grass clippings fall on the lawn. This will help you when you want to clean your lawn after the trimming and mowing is done. If your trimmer has a bump feed, you can bump it on hard ground a few times to release more line. If your trimmer has an automatic feed, it’ll release the line automatically based on the centrifugal force the shortened line creates. When your done trimming, release the throttle and let the engine be idle for a few seconds. Press the stop switch to stop the trimmer and let it cool down before you store it. A clean air filter will help get the best performance out of your gas string trimmer. It’ll also prevents damage to the engine. Make sure the trimmer is off and cool so you can open the filter cover and remove the air filter. Wash the air filter in soapy water and let it dry. Then you can put some motor oil on it and squeeze it so the oil coats evenly. Put the air filter back in position and close the filter cover. The spark plug of your gas string trimmer can get worn out. So you’ll need to check it as part of your maintenance. When the engine is off and cool, remove the spark plug boot and clean the area. Then remove the spark plug and check it for any damage. If it is damaged, you’ll need to replace it with the same model. Tighten the spark plug in place and cover it with the spark plug boot. The trimmer line will get exhausted often as you’re using the string trimmer. So you’ll need to have the line spool replaced. Open the outer spool and remove the inner reel. Separate the spring from the inner reel. Check if there is any damage on the reel or spool and if so, you need to replace it. You can use a cloth to clear the debris from the inner reel, spool, and the shaft. Remember to oil the moving parts of the gas trimmer before and after use. This will help keep it in good condition for a long time. Remove the gas from the tank when the trimmer is not in use for a long time. This will help extend the life of the trimmer. When using a 4-cycle engine, make sure there is enough oil in the reservoir for a smooth operation of the trimmer. The Tanaka TCG27EBSP is a gas trimmer that comes with a 26.9cc, 2-cycle commercial grade engine. This means you can use it for professional trimming or in a large garden. The commercial grade of the engine means it’s very durable and reliable when using it. The clutch is protected with an aluminum housing which ensures that it does not get heated. The shaft is made from lined solid steel which helps in reducing the vibrations so that you don’t get fatigued using it for a long time. The front and rear handles are padded which also help reduce the fatigue. You can change the cutting attachment with ease as you don’t need to use any tools. That’s because of the built in spindle lock of this string trimmer. The TanakaTCG27EBSP gas string trimmer comes with a 7-year consumer warranty which is pretty good considering some of the others available. The weight of this string trimmer is about 11.1 lbs without gas which makes it good enough to carry around the yard for a long period of time. The Husqvarna 128LD is a gas string trimmer that comes with a 28cc 2-cycle engine that is powerful for commercial use. The 17-inch cutting path of the trimming line will help you cover a large area fast while trimming. The Smart Start function of this string trimmer helps to start it quick and with minimal effort. The air purge removes air from the carburetor and helps in the quick start. The Husqvarna 128LD weighs 10.8 lbs which makes it lightweight for a gas trimmer. It should be easy to carry this trimmer around for a long period of time. The shaft is detachable which makes it easy to store and transport. There are several attachments available that you can use with this trimmer. Customers have complained that there’s a need to adjust the carburetor after a while with a special tool. And it does not seem suited for tall people as they have to lean over to use this trimmer. The Husqvarna 324L is a gas string trimmer that comes with a 25cc, 4-cycle engine. It’s powerful enough for your commercial trimming needs. The 4-cycle engine means it creates less noise and emissions. And it’s easier to work with and maintain than a 2-cycle one. It works on gas and you don’t need to worry about mixing oil and gas before use. It comes with an air purge that removes air from the carburetor. Along with the Smart Start technology this makes the engine start fast when you turn it on. This string trimmer weighs about 17 lbs which makes it heavy. You should not have problems using it in the garden but may feel fatigued after a long period of time. The Husqvarna 324L gas string trimmer comes with a limited one year warranty against manufacturing defects. The guard shield that comes with this trimmer does a poor job for protecting your feet from the debris. The Hitachi CG23ECPSL is a gas string trimmer that comes with a 22.5cc PureFire 2-cycle engine powerful for trimming weeds in your large garden. The shaft is 60 inches long which means it’s good for tall people to trim the weeds without bending and having back discomfort. The shaft is made from solid steel which means it’s very durable and helps get more power. The Hitachi CG23ECPSL comes with an anti-vibration system that’ll help you trim weeds for a long time without getting fatigued. The Walbro carburetor comes with a purge bulb that will help you start this string trimmer fast. It can hold 13 feet of polymer trimming line that is good for cutting tough grass and weeds. 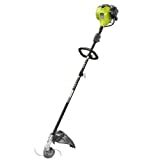 The string trimmer weighs 10.3 lbs without the gas and has a good balance. This will make it easy to use for long periods of trimming without feeling tired. The Hitachi CG23ECPSL comes with a 7-year consumer warranty which is the longest you can get for any string trimmer. This string trimmer comes with a bump feed where you need to bump the trimmer head on a hard surface to bring out more line. One drawback of this trimmer is this mechanism is not great and you’ll need to replace the head with a better alternative. The Ryobi ZRRY253SS is a gas string trimmer that has a powerful 25cc 2-cycle engine enough for your commercial trimming needs. The engine is full-crank which means you’ll get twice the life of the motor than a regular one. This trimmer is capable of taking attachments from the other universal brands. So you could attach a tiller, blower, or edger of any brand to the power head. The ZipStart technology of the carburetor will help you start it fast and with ease. The trimming head comes with a bump feed system which means you need to bump it on a hard surface to bring more string out. The Ryobi ZRRY253SS gas string trimmer comes with a limited one-year warranty which is the least you can get. The shaft is a straight line one that is suitable if you’re tall so you don’t need to bend while trimming. This trimmer weighs about 12.2 lbs which makes it heavy but comfortable to carry around in the yard. We recommend the Tanaka TCG27EBSP 26.9cc, 2-Cycle Gas String Trimmer as the best commercial string trimmer you can get. It comes with a commercial grade engine that is powerful and durable. The shaft is lined solid steel and along with the padded handles lowers the vibrations while in use. It is lightweight and comfortable to use for a long trimming session in your yard without fatigue. And it comes with a 7-year consumer warranty which is the best you can get compared to most of the other string trimmers.